We believe good health can best be enjoyed through good eating! That’s why all our products are fresh, homemade, nutritious and prepared without preservatives, additives or trans fats. We specialize in nutritious fresh food with no preservatives. It’s no secret the Mediterranean diet is one of the healthiest around! Abundant vegetables, fibre-rich beans, fresh breads and healthy fats found in olives and nuts are the mainstay of this region and essential to everyone’s good health and vitality. 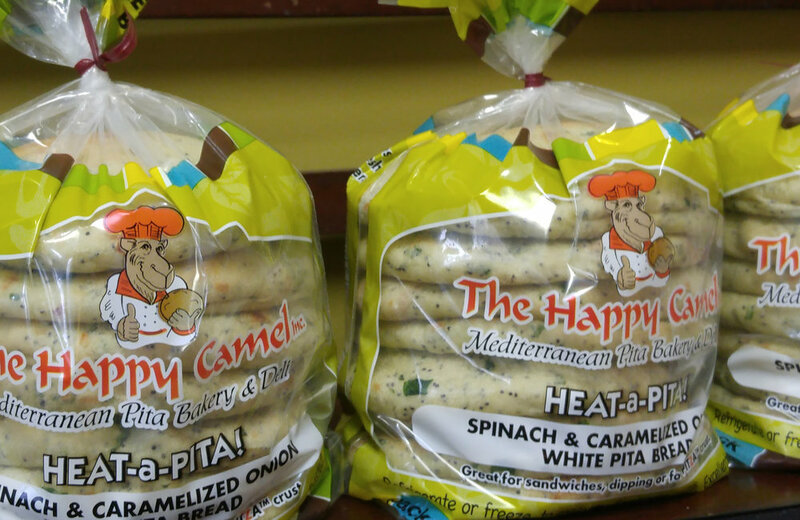 In addition to being good for you, The Happy Camel’s products also provide quick, easy meal solutions. 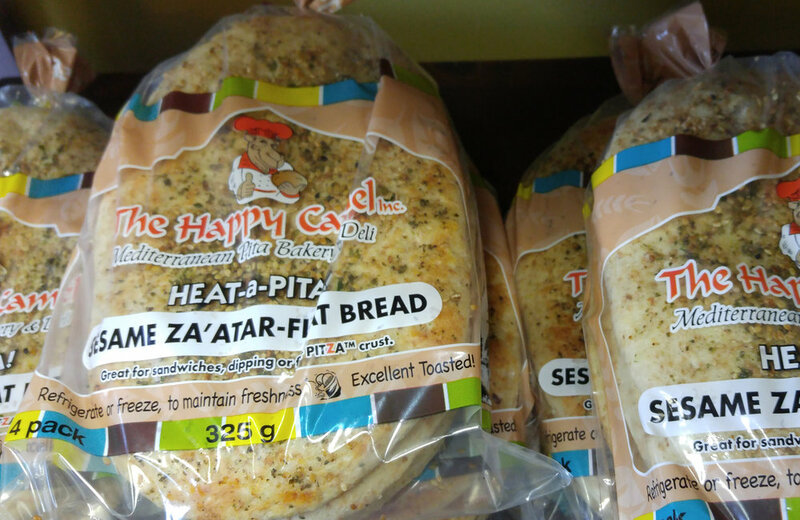 For example, our pita breads have become so popular for their convenience that we adopted a new slogan – It’s a Heat-A-Pita™. Just warm it up, pair it with a great-tasting dip or salad, and you’ve got nutritious meal in no time! "Love all the pita and dips! Highly recommend picking up some for your next....anything!" Sarah P.
"Great and delicious diversity of pitas, humus, spreads, etc. A true taste of the Middle East. I highly recommend The Happy Camel!" Moshe D.
The Happy Camel has been in business since 1998. It all started in the basement of Gerald and Sara Larson's family home. She started selling dips and salads at Farmer's Markets throughout Edmonton in 1998. The business started growing when they found a permanent home at the Old Strathcona Farmer's Market where, to this day, people line up to buy our tasty products. 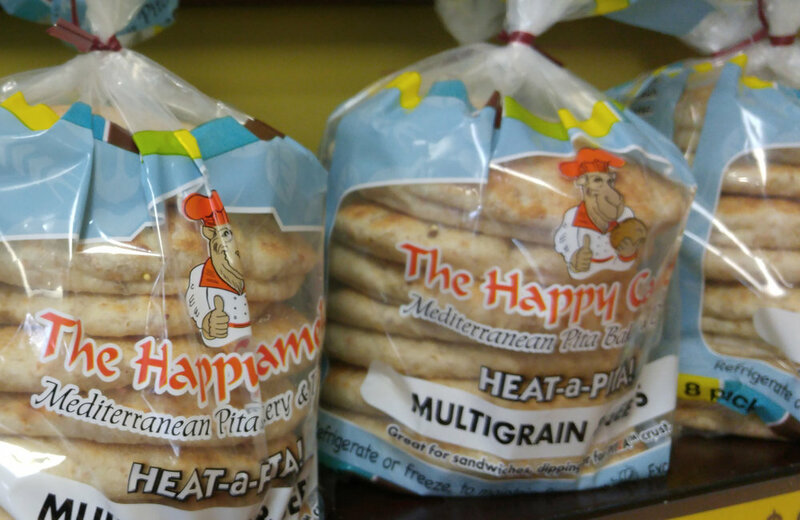 With the amazing response to our dips and salads, it only seemed natural to add pita bread too! So, Sara travelled to her home village in Israel to learn the secrets of baking the perfect pita bread. She returned with two electric pots which were used at the time to bake our pitas one by one. Again, the demand for the products led to an expansion in the business. After seven years of working from the basement, the Larsons relocated to The Marketplace in Callingwood and invested in an oven designed to suit the requirement of producing more pitas instead of one at a time. Now they could supply the entire city with our renowned pita and hummus. After 17 years of operation, the Larsons introduced the new owners Ron and Mary Anne Korn, who are proud to continue on the Happy Camel's journey. We continue to bring the goodness of the Mediterranean table to you in the freshest, most authentic way possible, following the Larson’s legacy and sparing no detail when it comes to quality and taste. Find us at the retail outlet in The Marketplace in Callingwood, Old Strathcona Farmer's Market and other retail stores throughout Edmonton. At the Happy Camel, we hand-pick and carefully prepare the ingredients that go into our wonderful breads, dips, salads and spreads, which are known across Edmonton for their mouth-watering freshness. Creating fresh Mediterranean dips and spreads is how we got our start! This is what first piqued the interest (and the taste buds) of our customers and lead to growth and expansion of our fresh product lines. All Happy Camel products are available in wholesale prices and sizes. Our fresh products are made with no preservatives, so we are able to offer wholesale supply to the city of Edmonton and surrounding areas only. © The Happy Camel Inc.